Happy Thanksgiving everyone. While there have been a couple of low spots this year, on this day I want to look back at some of the many wonderful things that have happened and be thankful for them. I want to thank all of my FB friends for making me laugh and sharing important news stories. I want to thank U.S. Senator Bernie Sanders for having the audacity to think he could win the Presidency and to mount an full throttled campaign that has avoided the usual personal attacks. I want to thank all of my friends who have hung out with me and made life so enjoyable. 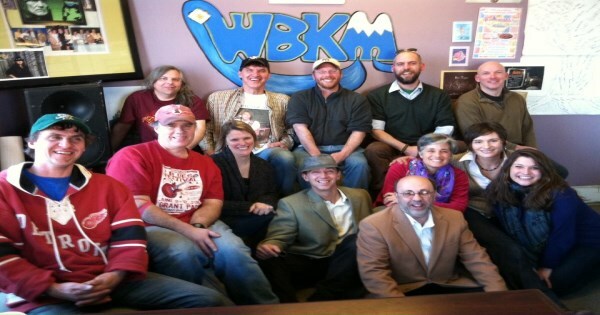 As you would expect, I am very thankful for all of you musicians who go out and play, and for WBKM.org for giving me a way to give some air time to your hard work. I really like the fact that I have a platform to showcase the wonderful music in our town. It’s so hard to do the show then walk home and do the write-up about it on Facebook and tag everyone that I can to let them know their music has been played. It’s so rewarding to wake up the next day and see the large number of likes and lovely comments. The thing that I have always most wanted to do in life is let musicians know that I appreciate what they go through and care about their music. The show gives me a rock solid way to do that, though showing up at their shows is vital too. I’ve been to great shows where I was the only one there, at least for part of it, and wonder what it must be like to put so much energy into creating songs and going through all it takes to get out, get set up and play it, especially if there is little or no appreciation. I feel it’s important to recognize the heart and soul of the musicians who do this. I feel it’s important to say that the songs they have dreamed up and let loose in our world matter. Going to shows is the best way to do that. Doing the radio show gives me another platform to express my love for what they do and for what they have created. Happy Thanksgiving to all of you who have found your art and are letting it loose in our world. Happy Thanksgiving to those of you who have yet to find your art. I encourage you to find your passion and let it make a better world for all of us. It will be hard but incredibly rewarding. And, if you even need someone to get your back and say I Believe In You, just give me a shout. That’s what I’m here for.